• July 2018 - The Football World Cup with Axiohm! Axiohm will be present at your side throughout the 2018 World Cup! Indeed, all machines of the Française des Jeux are equipped with thermal printers Axiohm. Go France! • April 2018 - Axiohm celebrates its thirtieth anniversary! Since April 1988, Axiohm has always undertaken to meet your needs through its constant search for innovations. 30 years later, the quality and excellence of its thermal printers make Axiohm one of the world leaders in this market. AXIOHM, recognized as a worldwide authority for thermal printing solutions, keeps on improving and innovating to answer its customer needs. We are proud to offer a wide range of printer products. You can be sure to find an Axiohm printer that fits perfectly into your application. 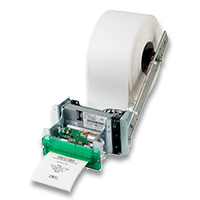 In today’s markets direct thermal printing is the technology of choice for receipt printing when reliability, ease of use and total cost of ownership are the leading criteria. Our challenge is to offer very competitive products while maintaining the level of performance that meets our customer needs and guaranteeing the level of quality Axiohm is known for.